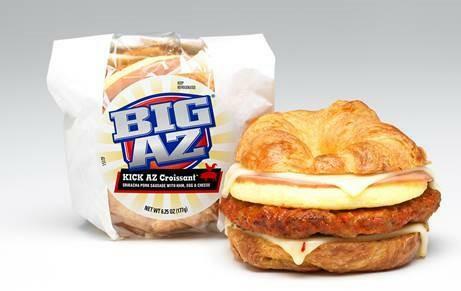 Ty son Foodservice recently introduced Big AZ KICK AZ Croissant to its Big AZ line of sandwiches, featuring sriracha glazed sausage with ham, egg, Swiss cheese and spicy pepper Jack cheese on a buttery croissant. Targeting the critical breakfast day part, each sandwich is hand assembled and wrapped in packaging that lets the consumer view the ingredients. Each sandwich is 6.2 ounces, offering 21 grams of protein per serving. The product features 14 days refrigerated and 270 days frozen shelf life. Big AZ KICK AZ Croissant comes with options to merchandise hot from the warmer or cold case for microwave heating on demand. The product is available in window butcher paper and in hand wrapped film packaging.